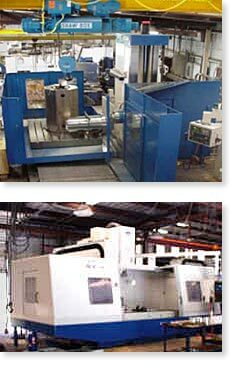 The Daewoo Ace B-130 (top) and the Daewoo Ace V-850 (above) are just two of many CNC machines available for precision machining. In addition to producing and marketing drill stem products, Packard International has in-house engineering capabilities, cutting-edge machines, and highly trained machinists, that enables us to offer precision machining services to our customers. Packard International can machine precision parts of up to 106" in diameter and 24,000 lb in weight — making us one of fewer than ten companies in the Greater Houston Metropolitan Area with such capabilities. For a complete list of Packard International’s CNC and manual machines and their specific capabilities, please phone 281-399-8771, e-mail sales@packardint.com, or click the link below to download a PDF.